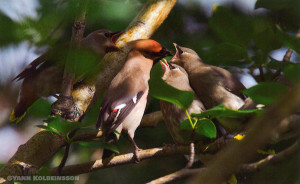 Two new species were added to the list of Icelandic breeding birds in 2011: Canada Goose and Bohemian Waxwing. In addition a Willow Warbler with young was found, a species which at least on one previous occasion was suspected of breeding. This article discusses these breeding records and a few other rare species which bred during the year. In many cases no precise location is given in order to protect the birds. Birds which are now well established or have bred here regularly for some time, such as Common Shelduck, Northern Shoveler and Goldcrest are not discussed here. These records are published at the responsibility of the author as the Icelandic Rarities Committee has yet to verify them. Canada Goose is an annual vagrant to Iceland, with birds coming both from Europe (part of the established introduced population) and their original breeding range in North America. A pair of Canada Geese bred in the Öræfi district of south-east Iceland in the spring of 2011. Locals found the nest in June and when it was examined on 15 June it was found to contain six eggs. This is the first breeding record of Canada Goose in Iceland but mixed pairs of Canada Goose and other Icelandic geese have been found before. These particular Canada Geese were large birds and could therefore have originated in Europe. The eggs hatched but nothing is known about the fate of the young. Eurasian Curlew is an annual winter visitor to south-west Iceland and south-east Iceland. Breeding was first confirmed on Melrakkaslétta in north-east Iceland in 1987 and birds have also bred in the south-east. A nest was found there in the spring of 2011 but breeding failed. European Woodcock has probably bred irregularly since 1970 and regularly in the last few years. Owing to its secretive lifestyle it has often proven difficult to confirm breeding and only a handful of nests have been found or young seen. Singing males on spring evenings are the best indication of the presence of breeding Woodcock. They have been reported from across Iceland, both in cultivated woodland and natural birch scrubland. This year males were seen in the following locations, all traditional sites for the species: Tumastaðir in Fljótshlíð (S) 30 April to 6 May; Hvammskógur in Skorradalur (W) 4 May; Heiðmörk (SW) 8-9 May, Kolgrafarhóll in Grímsnes (S) 13 May, Selskógur near Egilsstaðir (E) 7 June; Laugarvatn (S) 22 June; Stálpastaðir in Skorradalur (W) 25 June. People are encouraged to look out for Woodcocks, which could turn up in any suitable area of scrubland or woodland. Wood Sandpiper is an irregular breeder in the Mývatn area and has bred on and off since 1960. In the summer of 2011 a pair displaying territorial behaviour was seen, suggesting that they had young. Long-tailed Skua is an annual passage migrant on the way to and from its Arctic breeding grounds and wintering grounds in the South Atlantic Ocean. 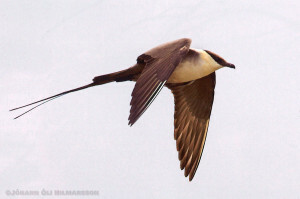 Long-tailed Skuas have bred in northern Iceland since 2003. In 2010 two pairs bred and there were probably also two pairs in 2011. A pair with a nest was found on 19 June but it is not known whether any young were raised. Little Gull is an annual vagrant to Iceland and its range has spread westwards in recent decades. Since 2003 it has been seen almost annually during the breeding season at Mývatn. A pair raised two young in 2008 and a nest was found on 17 June 2011. It is not known whether the breeding attempt was successful but the pair was still at the nest site on 6 July. 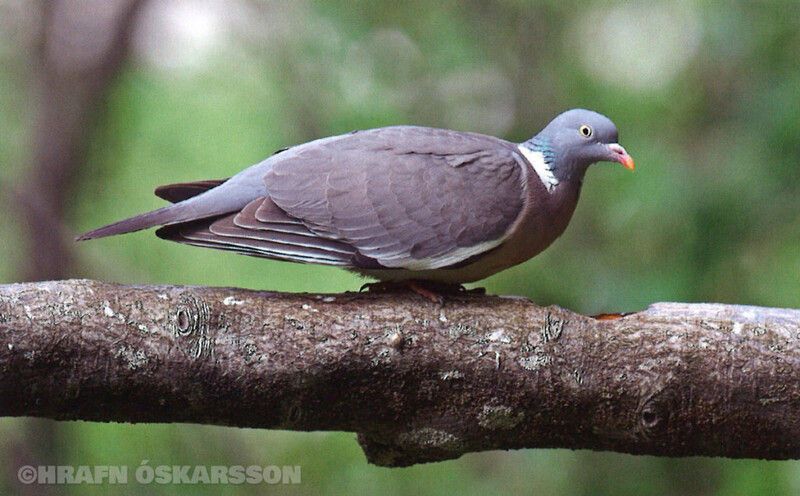 Wood Pigeon is a common spring vagrant and has bred in Iceland on and off for half a century. A local population may now be getting established, and increased cereal farming is likely to give Wood Pigeons a helping hand in this regard, as has been the case with Rock Doves. Wood Pigeons have been present at Tumastaðir in southern Iceland since May 2009. Numbers have increased in late summer and in February 2011 a nest and an unhatched egg from the previous year were found. In the autumns of 2009 and 2010 there were 8-9 pigeons at Tumastaðir and there were 6-7 in 2011. It is therefore highly likely that Wood Pigeons have bred at Tumastaðir every year since 2009. Snowy Owl has been an irregular breeder in Iceland for at least the last 80 years and is sometimes found in the same area year after year. Birds were seen on at least two territories in the summer of 2011. A nest was found on one territory but breeding was unsuccessful. 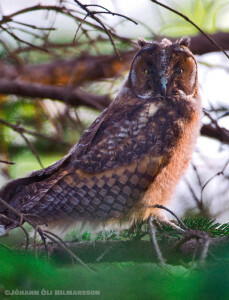 Long-eared Owl appears to have established itself as a regular breeder in Iceland and that comes as somewhat of a surprise. Three pairs with young were found in an area of holiday homes in southern Iceland, where they have bred for at least 10 years. Reports of more birds in this area were also received. A breeding attempt from northern Iceland in 2010 was also reported. Barn Swallow has bred on and off in Iceland since the early part of the 19th century but it has never become established. In the summer of 2011 a pair of Barn Swallows bred at Haganes in northern Iceland and raised four young which were seen on 16 August. Barn Swallows also bred at Raufarhöfn (NE) and the locals believed that they bred twice. The exact dates are unknown but a pair was seen with three young on 10 September. Barn Swallows also bred in a shed at Þórisholt in Mýrdalur (S). They were first seen at the end of May/beginning of June and for a while there were two pairs. One pair bred under the rafters and the young fledged in July. The winter of 2010-2011 saw a large invasion of Bohemian Waxwings in Iceland and birds were reported into the summer. In June and July pairs or at least two birds together were seen in at least five locations: in Langadalur in Ísafjarðardjúp (NW) on 2 June, in Ásbyrgi (NE) on 14 June, in Dalvík (N) 30 June, in Fellabær (E) in July and finally in the Mývatn area (NE). They were known to breed in 2-3 locations. In Dalvík birds were seen at Whitsun and again at the end of June. Around 25 July a photo was taken of two young which had narrowly escaped the clutches of a cat. On 27 July a pair was seen near Mývatn with four recently fledged young, and that summer a pair with three young was reported in Fellabær (E). Willow Warbler is an annual vagrant in Iceland, most common in autumn but also frequent in spring when they are often heard singing. On 20 July a bird was heard singing at Hof í Öræfum (SE). On 9 August a pair was seen feeding three young. This is the first confirmed breeding record of Willow Warbler in Iceland, although breeding was suspected at Kvísker í Öræfum (SE) in 1989. Common Crossbill has bred in Iceland annually since 2008 but until then only two breeding attempts were known. Common Crossbills were seen at known and likely breeding locations in many parts of Iceland. Much of the information on breeding was from Grímsnes (S). A recently fledged chick was found dead in Grímsnes on 22 May. A pair with two fledged chicks was seen at Snæfoksstaðir in Grímsnes on 1 June and possibly the same pair with four young was seen on 3 June. On 15 June a pair with two young was reported in Vaðnesland (S) and they had apparently been seen almost every day during the month. A pair with three young was seen at Álftavatn (S) on 17 June and on the same day two young flew into a window and were killed. Several birds were seen with fledged young at Heiðmörk (SW) and a pair with young was seen in Skorradalur (W). Finally fledged young were seen at Hallormsstaðaskógur (E) and Jafnaskarð (W). Eurasian Siskin bred in conifer plantations across southern Iceland in 1994-97, 2001 and in good numbers in 2008 in southern and eastern Iceland. Since then only isolated breeding attempts have been reported. A singing male Eurasian Siskin was seen in Elliðaárdalur in Reykjavik (SW) from 28 May to 19 June. On 20 June two males, a female and three fledged young were seen. No Lapland Longspurs were seen at Látrabjarg in 2011 despite being looked for.